This is my last blog post, and I’ve learned so much since I first started. My progress in my opinion is nice, and I’m excited for my future projects with tie dye. I decided to come to a close with something new; socks. I have already done shirts, and I wanted a change so I decided to dye a new type of material. I went to the store and bought a new pair of socks and I got to work. “If you want to avoid feathering, fully saturate the folds around the rubber bands” (Simon-Alexander 105). I found this tip very helpful because I wouldn’t have done this if it had not been in the book and my socks would have been primarily white. The way I put the rubber bands on was chaotic, which is normal for me. I have found out during my project that chaotic or “abstract” art is my favorite. My socks were saturated and I was hoping they would look good, I had high hopes. I decided to let my socks sit for 24 hours this time. Last time my short looked nice, but I wanted it to be a bit more vibrant. I tackled cleaning up again, and I have definitely learned some things about keeping it cleaner while dying. Instead of using towels I placed my work on a plastic bag so when I cleaned it up I could throw it away. 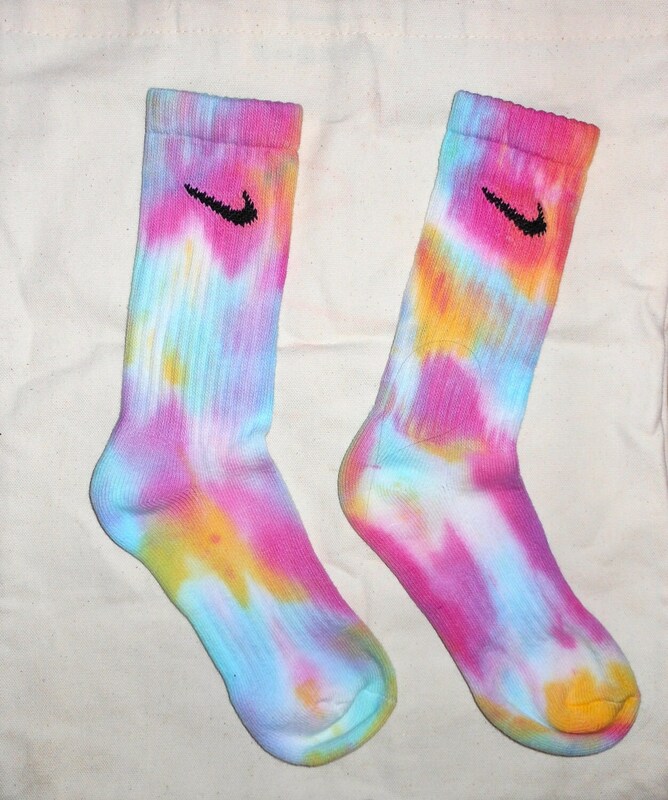 It worked great and I recommend this for anyone wanting to try tie dye. My socks were washed and they came out great. They were vibrant and well covered. I’m glad that I decided to do socks instead of a shirt this time. It gave me even more experience than I already had. I’m glad that I decided to do tie dye for my project. I had a blast and I got some pretty cool shirts and a nice pair of socks out of it. "Dye method: direct application" (Simon-Alexander 105). that is one thing I regret. I only did direct application and not the immersion method. That method is when you put a shirt with rubber bands in a bucket of dye and leave it to soak. The net time I tie dye this will be the method I try. Q: what would you want to tie dye if you had to dye one thing? I really enjoyed this! Your socks look great. And to answer your question- I'd probably just do a shirt! You did great with the socks. It really shows improvement from when you did your t-shirt. I think the problem may have been that you used too little color on the shirt, while this time it was proportioned out to the size of the socks. As far as tie dying goes I would probably do a lanyard or something small, but I wouldn't have the patience of waiting 24 hours. Bhardeep Dhaliwal: Lightroom Editing- Portaits? Should You Play with a Plectrum?